Original drawing in Indian ink + blue pencil + black pencil on raster scratch card (gillot paper). Illustration project for a book or a humorous journal. Size: 38.5 x 28 cm. Beautiful drawing and unusual subject. Hand delivery possible paris 9th. 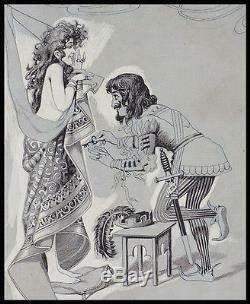 The item "the original drawing chastity belt in ink around 1890 eroticism" is on sale since Tuesday, March 12, 2013. It is in the category "art, antiques \ art of the nineteenth and before \ drawings, wash". The seller is "dessinoriginal" and is located in / in paris. This item can be delivered anywhere in the world.